Rabbit IgG-UNLB (SB Cat. No. 0111-01) was resolved by electrophoresis, transferred to PVDF membrane, and visualized using Goat Anti-Rabbit IgG-HRP (SB Cat. No. 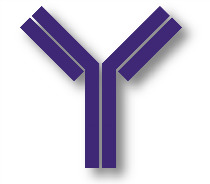 4030-05) secondary antibody and chemiluminescent detection.